Nicola Barbatelli, medieval scholar, discovered a painting in November 2008, in Salerno, which today is exhibited in Villa Fiorentino. It is a painting in tempera grassa on a poplar panel (44 x 59 cm) which depicts the face of Leonardo da Vinci. What makes this painting exceptional, is the fact that it is not a copy but an original from the turn of the 14th century. Following a year of scientific, historical-artistic and documentary research we can be very confident that the painting is in fact a self-portrait of Leonardo da Vinci. In order to reach such a conclusion, Leonardo experts from various fields of research and from various international universities, have carried out all sorts of research and analysis and are in agreement that the painting is an authentic self-portrait of Leonardo. Below are mentioned just some of the studies which have been carried out. The INNOVA centre of the Federico II University of Naples, headed by Prof. Terrasi, carried out all the physics research from radiocarbon 14 dating to the identification of the pigments used in the painting using energy-dispersive X-ray fluorescence analysis (ED-XRF). The radiocarbon 14 dating shows that the wood used dates from between 1459 and 1523 (Leonardo was born in 1453 and died in 1519). The pigment analysis confirms that the painting was executed using a technique and materials compatible with the age of the support and that there is no evidence, in the unrestored areas, of modern pigments or materials. The back of the board carries an inscription in latin: PINXIT MEA. The writing is upside down and re-appeared only after careful cleaning of the board. Both the ink – irongall, normally used by Leonardo – and the handwriting have been analysed. The graphological analysis, carried out by specialist Silvana Iuliano, attributes the writing, with comparative evidence of indisputable validity, to the hand of Leonardo da Vinci. The various preliminary cleaning phases of the painting carried out by Giancarlo Napoli of the Suor Orsola Benincasa University in Naples, have revealed micro-cracking (craquelet) of the paint surface which cannot be reproduced artificially and which guarantees the authenticity of the pigments used. Innovative fingerprint research was carried out by Prof. Capasso of the University of Chieti, in collaboration with Gianfranco De Fulvio, Commander of the RACIS squad (Carabinieri Branch Scientific Department). This technique, developed by Prof. Capasso, makes use of experience and a database that are totally unique. The outcome of the analysis was the discovery of a fingerprint on the side of the feather, which matches one found on another Leornardo painting – The Lady with an Ermine. This amazing result demonstrates the actual contact between the hand that painted the Lady with an Ermine and the Lucan painting. The IR reflectographic analysis carried out by Andrea Rossi, specialist in medical imaging, demonstrates great similarity with images taken from the Mona Lisa and highlights the retouching which has taken place over time. Two wholly innovative studies were carried out on the physiognomy of the face portrayed. Prof. Felice Festa of the University of Chieti, carried out comparative cephalometric analysis between the Lucan painting and other faces attributed to Leonardo a Vinci. The research, which was for the first time approached in a quantitative, measurable and reproducible manner, made use of the same methods of measurement designed by Leonardo himself. The outcome of the analysis is that the face is the same as at least two other drawings which are traditionally held to be the faces of Leonardo and shows surprising evidence of a profound knowledge of anatomy with perfect knowledge of the facial muscles. A parallel study on the physiognomy of the face was carried out by the Museum of the Ancient Peoples of Lucania in collaboration with Tallin University in Estonia. This morphological study included a 3D reconstruction of Leonardoâ€™s face which we can again for the first time in 500 years. 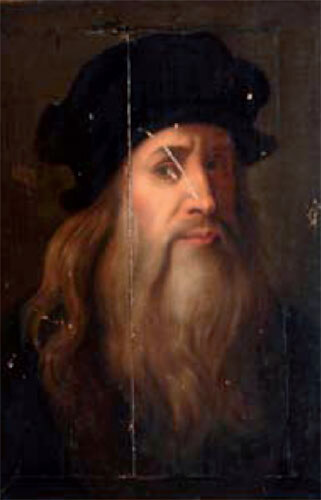 The face, taken from the Lucan painting, was compared to other faces of Leonardo and the same conclusion as that of Prof. Festa was reached. In addition, it has been possible to carry out virtual experiments on the use of a mirror chamber, the type of illumination and binocular sight. It has thus been demonstrated that the Lucan painting derives from a combination of two views of the face staggered by 18Â°, exactly like the images we would see of ourselves if we looked into a mirror from a distance of 15 -20 cm and observed first with one eye and then with the other. This result has been confirmed in the studies carried out by Prof. Peter Hohenstatt and is a further demonstration that we are in the presence of a self-portrait of Leonardo da Vinci. Lastly, the historical-documentary research by Prof. David Bershad of the University of Calgary in Canada, confirms an historical event which could have brought the painting to the south of Italy, to Lucania, from where it seems to have emerged. We conclude this brief presentation of the work with a curiosity which relates to the place where the painting seems to have remained for such a long time. That place is Moliterno in the Lagonegro area of Lucania. According to a story told by Merezkovsky, a Russian author, at the beginning of the 20th century, this is the place where Mona Lisa died. It is almost certainly a legend but still an incredible coincidence. Testi e foto © 2019 Surrentum. All rights reserved.